I apologise for writing about an event that has passed but History Girls can't choose their dates. On November 5th, I was in Lewes, staying with my old school friend Charmian, invited to witness the phenomenon that is Bonfire. Not Bonfire Night, or Guy Fawkes night. Just Bonfire. When I was a child, Bonfire Night was one of the highlights of my year. Preparations began in September, collecting wood for the bonfire, rummaging through the rag bag for bits of clothes to make the guy. We lived in a far less controlled and PC world back then, when children could build bonfires and buy fireworks and we would go round for weeks before the great day, letting off bangers and arguing about which ones made the best bangs. The bonfire would be constructed in the back garden, the guy perched on top. Dads would light the fire and when it was going well, all the conkers we'd collected would be thrown on to fizz and pop. Then the fireworks would be let off as we waved sparklers and munched on sausages, baked potatoes and parkin. Fire and feasting. As a child, I had no idea that I was taking part in a tradition that went back and back, before the Gunpowder Plot and Guy Fawkes failed attempt to blow up Parliament, before All Hallows Eve, to the Celtic Festival of Samhain and probably before that to some ancient time when people first built fires to drive back the encroaching darkness of the waning year. I did not know about any of that then but I knew it felt special. 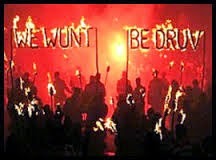 This year, at Lewes Bonfire, I had that feeling again, of excitement, of spectacle, of the wonder and terror of fire. Bonfire is always held on November 5th, unless that date falls on a Sunday, not the nearest convenient weekend. Always the date itself. Lewes is divided into a number of Bonfire Societies: Cliffe (who do things with burning tar barrels and still burn effigies of the Pope), Commercial Square, Borough, Southover, South Street, Waterloo. The names refer to areas in the town and each Society has its own bonfire site where they have built a huge bonfire and will eventually let off spectacular fireworks. The territorial nature, the year round preparation, the fierce pride and competition, the level of obsession, the feeling that this is only for Lewes people, that the 40,000 visitors are interlopers, reminded me of Siena's Palio. Before the bonfires are lit, the Societies, joined by societies from outlying towns and villages, parade through the streets bearing lighted torches and towing effigies which will be burnt. Many of the marchers wear smuggler uniforms, each Society sporting different coloured stripes. They are led by 'pioneers' in fancy dress: monks, buccaneers, Civil War soldiers, Mongols, Ancient Greeks and Romans depending on the Society. The differences and rituals are impenetrable to all but locals. The only thing that a visitor can do is stand back- well back - some of the marchers drop bangers and set off strings fire crackers while spent torches are thrown down to gutter at the spectators' feet - and enjoy the spectacle. There is something wonderfully anarchic and atavistic about the parade, feet marching, torches flaring, the air thick with tarry smoke. Apart from Guy Fawkes, there are burning crosses for 17 Marian Martyrs, Cliffe still marches under a No Popery banner, effigies of Pope Paul V (Pope at the time of the Gunpowder Plot) are burnt. Not all the effigies are five hundred years old. There are more topical targets. Vladimir Putin in a mankini was paraded this year and the Bonfire Societies still court controversy. 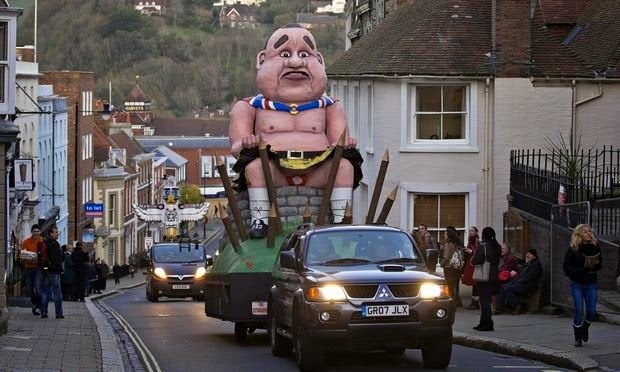 An effigy of Alex Salmond caused a storm of protest on twitter. I saw this one being trundled into position earlier in the day. There were two apparently, one of them was blown up anyway, despite official assurances to the contrary. Once the parade is over, each of the Societies heads off for its bonfire site. The bonfires are lit one at a time until it looks as though the whole town is on fire. Then there are the fireworks, the societies competing with each other to light up the sky. Fabulous! That definitely has to go on my bucket list. I think From your post I really got a sense of the edginess and other worldliness. Thanks, Elizabeth. Definitely worth going. Despite all the people, you can't miss the experience. It's all around you and up in the sky. Yeah! Another one scribbling on a buckest list here. Great post, Celia. Really enjoyed it. Hutton argues that November 5th goes back no further than Guy Fawkes - but the more I think it over, the harder I find it to believe that. Thank you, Celia - great post. It's twenty five years since I experienced Bonfire in Lewes, and I still remember how thrilling (and yes, scary) it was. There is a definite edge - of something old, anarchic and dangerous. It's nice to have a use for conkers. I can't resist picking them up, even now! Well, I was rather startled when attending Greek Easter in Crete, to see Judas burned in effigy with a bang and a flash. This may have unpleasant resonances of anti-Semitism, but I rather felt it was all the bad luck of the old year being burned, and looking forward to a better one, Easter being a Spring festival. Thank you for this blog, Celia, it really does seem to bring to life an older, rowdier England..
POPPIES, ORANGES AND LEMONS by Penny Dolan.